Russian Defense Minister Sergei Shoigu's trip intended to show Russia’s continued interest in the region. Russian Defense Minister Sergei Shoigu concluded an official visit to Venezuela, Nicaragua and Cuba on Feb. 14. The trip, which did not include the signing of any new agreements for weapons sales, served to demonstrate Russia’s continued interest in Latin America at the same time NATO is increasing its presence in Eastern Europe. Shoigu’s stop in Cuba also took on more significance after the recent steps taken by the United States to normalize relations with that country. It was Cuba that paved the way for Soviet weapons into South America. The volume of weapons and military equipment delivered from the Soviet Union to Cuba between 1961 to 1991 amounted to about $16 billion. With the help of the Soviet Union, this small island had perhaps the best army in South America as late as the 1990s. The fall of the Soviet Union cut off most Russian aid, but last year, the Russian government wrote 90 percent of Cuba's debt left over from the Soviet era – approximately $32 million. It is not yet clear what Russia expects from such a gesture of goodwill, although at the least it may allow Russia to keep a toehold in the Caribbean country. Venezuela is Russia's largest trading partner in Latin America, mostly due to the initiatives of former Venezuelan President Hugo Chavez. After coming to power in 1999, Chavez sought political rapprochement with Russia, particularly in the form of military-technical cooperation. 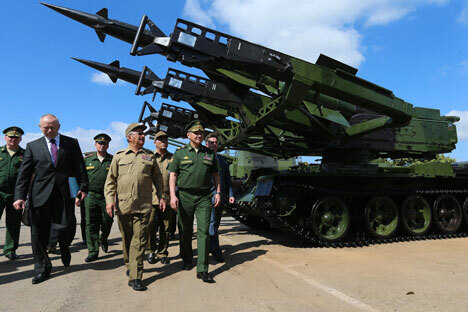 Chavez began a program of large-scale purchases of Russian weapons as part of his drive to modernize the Venezuelan military. In recent years, Venezuela has purchased about $12 billion of Russian military equipment, including Su-30MK2V fighter jets, Mi-17V5, Mi-26T2 and Mi-35m2 helicopters, T-72B1 tanks, Smerch multiple launch rocket systems, S-300V anti-aircraft missile systems, Bal-E mobile missile systems for the Coast Guard, Nona-SVK self-propelled systems and MSTA-S self-propelled howitzers. During Shoigu's visit to Caracas, he agreed with his Venezuelan counterparts on joint air defense training. In addition, Shoigu accepted an invitation to repeat a visit of Russian Navy warships to the ports of Venezuela. Shoigu's visit to Nicaragua was the most practical of the trip. While in Managua, Shoigu signed an intergovernmental agreement with Nicaraguan officials simplifying the procedure for Russian warships to enter Nicaraguan ports. The agreement on simplified procedure for Russian ships to visit Nicaragua will expand the range of naval cooperation between the two countries, Shoigu said. Shoigu also said that a joint training program for Russian and Nicaraguan military personnel has been approved. Under the program, the number of military officers from Nicaragua in Russian military schools will be increased. At the moment, military-technical cooperation between Russia and Nicaragua is limited to supplying equipment to local anti-narcotics forces, two missile cruisers and four patrol boats. According to military expert Alexander Sukhanov, Shoigu’s visit is unlikely to bring about any new large contracts for military equipment, but it’s effect should not be underestimated. “Russia is actively promoting its interests in the Latin American region offering real forms of cooperation to partner countries. And sooner or later it will bring a positive effect,” Sukhanov said.